Matching DNA With Medical Records To Crack Disease And Aging : Shots - Health News A massive research project in California is beginning to show how genes, health habits and the environment can interact to cause diseases. The new combination of genetic and health information is one of the most powerful research tools on earth, a researcher says. A light micrograph image of telomeres, shown in yellow, at the end of human chromosomes. 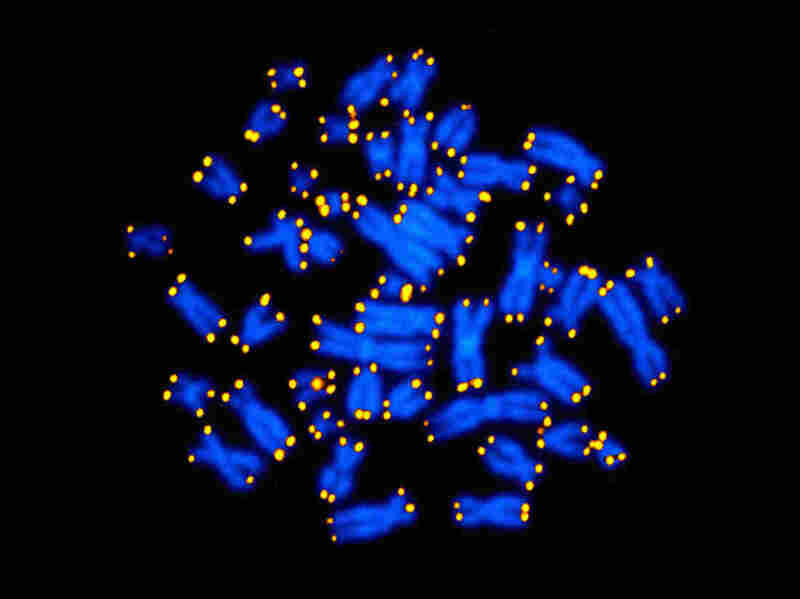 Women tend to have longer telomeres than men and tend to outlive men, according to new research matching genetic information with medical records. A massive research project in California is beginning to show how genes, health habits and the environment can interact to cause diseases. And it's all possible because 100,000 people agreed to contribute some saliva in the name of science. The project's goal is to find new ways to identify people at risk before they develop problems like heart disease, cancer and diabetes. This month, researchers reported on some early successes involving cholesterol and a genetic marker of aging at the American Society of Human Genetics meeting in San Francisco. The saliva came from members of Kaiser Permanente's health plan in Northern California. "We sent them a little plastic kit that looks sort of like a large contact lens case," says Cathy Schaefer, an epidemiologist and executive director of Kaiser's research program on genes, environment and health. Before long, she says, people had mailed in 100,000 saliva samples. One of those people is Renee Sharp, a Kaiser member who is also a scientist at the Environmental Working Group. "When I heard about the study I was very excited it was happening and wanted to be involved any way I could," she says. The National Institutes of Health provided grant funding of nearly $25 million, which allowed Kaiser and UCSF to process the saliva samples in just 15 months. Then came another daunting task: matching each participant's genetic information with detailed health information in Kaiser's electronic records, which go back to 1995. The records include diagnoses, procedures, prescriptions and results of medical tests. For people who sent in saliva, Kaiser also has information on smoking and drinking habits, body mass measurements, and even geographic information that could be used to estimate exposure to certain chemicals in the air or water. This combination of genetic and health information has created one of the most powerful research tools on earth, says Nobel laureate Elizabeth Blackburn of the University of California, San Francisco, which is a partner in the Kaiser project. "It's just this playground of incredibly rich data," Blackburn says. "We're just scratching the surface." It will take years to fully explore the data. But early results are promising. One study, presented at the ASHG meeting, looks at genes that affect levels of low-density lipoproteins, also known as LDL or "bad" cholesterol. "I think we discovered something like 45 different genetic variations that influenced that measure," says Neil Risch, a geneticist at UCSF. "Some were known before but a number were not previously known." Another early result involves cholesterol drugs known as statins. Researchers realized that the saliva samples included 28,000 people who had started taking statins in the past few years. So they looked to see whether certain gene variations affected how well the drugs worked. "We have already shown that there are genetic factors that are predictive of drug response," Risch says. And future studies may reveal which people are likely to have dangerous side effects from the drugs, he says. The Kaiser project is also turning up new information about differences in the way men and women age. That information comes from measurements of telomeres, which are like caps on the ends of chromosomes. These caps tend to shorten with age and with exposure to environmental factors like cigarette smoke. The Kaiser project included telomere measurements as part of the genetic information extracted from saliva samples. "For many years people have know that women and men have different average-length telomeres," says Blackburn. Women tend to have longer telomeres than men and they tend to outlive men, she says. But the Kaiser project showed that as young adults, men and women have telomeres that are about the same length. "We found there's a big split above age 50 and it gets bigger and bigger with age until about 75 or so — a marvelous new finding nobody had ever seen before," she says. The data also show that people with very short telomeres are more likely to die at a younger age. Findings like that suggest that someday, doctors probably will look at telomeres and lots of other genetic information when assessing a person's overall health, Blackburn says. "Most of the time the blow falls and we say, 'Oh, we've got a disease,' " she says. "Well, it's not an event. It was a process that took years to happen inside our bodies." And the Kaiser project should help identify ways to interrupt that process, Blackburn says. "The National Institutes of Health provided grant funding of nearly $25 million, which allowed Kaiser and UCSF to process the saliva samples in just 15 months." A previous Web version of this story, as does the audio, incorrectly said Affymetrix and a team from Kaiser processed saliva samples. The processing was done by Kaiser and UCSF.